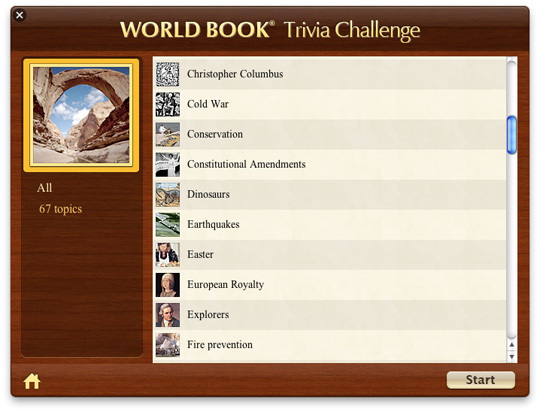 Test and improve your knowledge with our WORLD BOOK Trivia Challenge game. It covers a wide variety of topics from history and literature to sports and space exploration, allowing you to match your wits against WORLD BOOK and maybe discover something new along the way. Trivia Challenge. Do you know what the word Kwanzaa means in Swahili? Or how many voyages Columbus made to the New World? Check your answers with Trivia Challenge, or go to the main encyclopedia to read more!